Appearance description: Echani born, Shaun stands just around average height, with a warrior's build. Bright white hair and bronze eyes, he is a rare cross between an Echani and an Energy Vampire. Despite being of mixed blood, Shaun looks very much like his own father. While he does not know who his mother is, he has been told that he has his mother's eyes. Generally keeping his hair brushed back, its otherwise unkempt. He dresses normally in a simple pair of jeans and a t-shirt, and on occasion will wear a jacket when going to a more formal setting. Blades & Hands: ​Hand him a sword, and Shaun will know what to do with it. Likely the best swordsman within the Mafia known as "The Family" Shaun or "Auberon" has followed the path of many Echani before him as a swordsman, bladesman, and martial artist. Archery/Ranged Weapons: As a young man, his father taught him how to hunt, to bring food upon the table, and how the weaponry of the galaxy works. No ace shot, but still very capable in his hands. Adaptable: Living with his father taught him many things. Being adaptable allows him many avenues of escape, fighting back or otherwise. Sure, he can live on his own off the grid, or be able to adapt to a battle, but if he doesn't have the right tools for the job, then even this skill of his can still fall short at times. 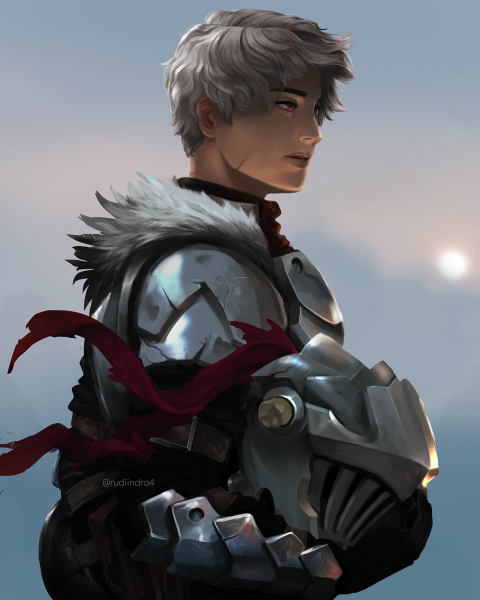 Blacksmith: Being the apprentice of a Blacksmith, Armorer, and Weaponsmith, Shaun has learned quite a bit in the way of making weapons and armor. As such, he is talented with the hammer and anvil. Over time of creating force artifacts, researching some, and even finding them, Shaun has much still to learn, but is talented. Moral Compass: Shaun is a rather lawful person. However, he leans more along the line of common sense and the natural order of things to be the real rules and regulations. So forms of government that oppress people are not something he agrees with, nor does he like anyone who aids, or works with these systems. Shaun sets his own moral code above the law. Echani Born: Born to an Echani Father, Shaun is rather skilled in combat in general due to the culture. Growing up with the idealism that combat was an outlet of communication, as well as enjoyment, and even training. He holds fast to this, and even holds others to it even without meaning too. Vampiric Blood: As a half-breed, Shaun has quite a few physical attributes of the Energy Vampire species. Faster speed, stronger strengths, enhanced senses, can consume energy from living beings, and even has a small healing factor. However, while these are all good, they wouldn't compare to that of a full-blood Vampire. Faster than others of the Echani, but slower than those of his Vampire heritage. No Gods, No Destiny, No Fate: Shaun is an Atheist. He has no beliefs in goods, or other worldly entities that can affect him. While he does know of people being able to use the force, or otherwise abilities and Magicks. Thus when given a reason for the gods, or otherwise explained of gods or fate, or destiny, he will deny it completely and even consider the person more stupid than he is even without his education. Independently Happy: Shaun is a young man who finds himself unable to depend on others. Living all of his life being taught how to be independent, or the ability to do things on his own, he doesn't call upon others to help him, and while working on a team is fine, He doesn't need anyone to baby him. Peace and Quiet: Shaun wants to live where there is peace and quiet. He wants to live out among the wilderness where no one can bother him. Cities are not his kind of place to be. Shaun is a man for the forests, open plains, and rivers by the wayside. Dull: Shaun rarely shows emotion. Keeping a heavy straight face, no smiling, no laughing, no nothing. This extends to him not having any of the small talk, or speaking just to speak. L-D-R: Most fights with Shaun have him within reach of his opponent. So fighting him from longer distances is highly recommended. Stuck in a Dream: Shaun has quite the dream he wishes to fulfill. What that is, no one is quite sure. My son has left me today. It only seemed like yesterday when he arrived by messenger to my home. I remember the instant thought of letting him be taken in by some orphanage or leaving him to the wilds. Yet, the crying face of the child, the bright bronze eyes that resembled his mother, and the small tufts of white hair were unmistakably mine. I couldn't just leave him. I didn't want him as a reminder of what happened to me. How I was... violated. Yet, it was not his fault for this. His life had yet to begin. I tried my best to let that pass. The idea that the monster had birthed a child so innocent. The memories flooded me. Life of my young child, my son growing up with a smile on his face from eating a tasty meal. Learning of the bow that I used to hunt said food, and the training of him how to use it. The sadness in his voice as I couldn't bring myself to talk to him about his mother, the pain as he learned not to touch a hot flame, the pains of relationships in his youth, and the struggle of the change between a child, to a boy, and into a man. He was a gift I never asked for. Yet, he was the only give I could ever have wanted. No price could ever amount to the pain, the joy, the elation, and the sadness I now felt as he was leaving me. He was long gone by now. Enough to allow my tears to flow. I entered his now empty room. All he left behind was his memories. In the closet, I opened it to find his old toys he never got rid of. An action figure of some soldier or stormtrooper. I never remembered what kind of game it came from, but I know very well he held onto it for a very long time. The suit he wore to the ceremony of the Echani culture. The first vibroblade he owned was resting in the corner. I smiled just a little. Knowing that while his life was still young, that he would go many places and do many things. I just hope and pray that he learned all he could from me. I knew he loved me. While he never said it, I could feel it in his voice as he told me goodbye. I held onto that. Reaching for the vibroblade, I softly held onto it as I sat upon his bed. Feeling the weapon slowly become more heavy as I smiled to myself, I accepted what was happening. While he wouldn't see me in the flesh, he knew I would always be with him. Breathing in and out, I let the weapon drop from my hands as I faded. Letting the moon, the sky, the stars, and the force take me. May your sword stay sharp my son. Years have passed since I have left my home. Moving to the city and training under Darren Shaw. A once fighter within the galaxy. Why he has chosen to return home, is for him to keep of himself. Stories of his daughter out on her own have only made me grow closer to him. Seeing as how the man has dealt with quite a bit in his time, seeing that one day, I may too be able to return to my own home, and retire. What state I will be in? What would I have done to reach it? I know not. Working for the Blacksmith has taught me many things. He furthered my own skills and studies within the creation and fabrication of swords, armor and even weapons. Darren helped to shape and mold me into not someone who can better perform my job, but someone who can ask the right questions to make the job better. I do find enjoyment from his lessons. While they are not strictly staged in a classroom or a learning environment, I learn from him by example and by his own accounts of what has made him better in the field of work. It was with the expansion of our company that I had decided to take a leave. Working as a hunter and using my skills as a trained fighter. Studding ever so briefly under a Jedi Knight, and finding companionship with a Loth-Wolf by the name of Kin. Growing in my knowledge of the real world, and from the lessons of Shaw, I have aided in the production of various tools and utilities for my company. It was surprising to me that Shaw gave me all of the inheritance of the company. As well as gifting me with a strange mask. While I had noticed that Shaw seemed to be having a haze look over his eyes. Continuing with my hunting, I came across a young woman. Ember. Another Echani such as myself that our working relationship seems to be growing into something more. She seems familiar. As if she were from my dreams and nightmares. I shake it off for the time being and focused on my new given job. A woman seeks out my talents within a Crime Syndicate named, "The Family." Joining this "Family" has opened up quite the opportunity for me. Moving to a planet called Dohmus Prime, the Donna of the family sent me to perform some tasks for her. Difficult and quite challenging at first, I found that these tasks were really a test for me. While Ember would be given full rights within the family as I brought her along, It was really myself, that Ahtemis wanted. She wanted me to be her left hand. The personal man she went to when she wanted something done discrete and professionally. To protect the identity of myself, I used the mask given to me by Darren as my personage of "Auberon." The Left hand, and titled as the "Gardener" of the Family. I wanted to also cover up myself. Protect me from the battles that would surely come. For this, I created armor. Using much of my own design and being paid to do it by the Family. A very nice inclusion to this. Given the approval for my own sphere of influence, Ahtemis owned Dohmus Prime, while I was given a choice of other planets to choose from. Corscaunt was too city like for me. And a newly name Noverskaa was already taken by another of the Family. I had Nar Shaddaa. I accepted my duties as this "Gardener" for the Family and with the aid of Ember am creating a foothold for the family on Nar Shaddaa. A place where anyone can come and attempt to join. While Noverskaa is our main base for soldiers and military, Corscaunt is our second home away from home, Nar Shaddaa is our recruitment and Black Market homes. Owning a Pawn shop that is slowly growing, and even moving a secondary location of Yusanic Ironworks to Nar Shaddaa. However, it was during this time that I noticed Ember had began to change and become someone else entirely. I was unsure of what this was, but as we are planning on heading out to Dohmus Prime to investigate some ruins on the behest of the Donna, I worry what may happen to her as well as myself. Edited by Shaun Castanic, 23 November 2018 - 12:56 PM. Shatterpoint - Apex - A rare perception of the force, this skill allows Shaun to perceive, and sense weak points within many things. This ability alone can break many items, creations, and even people or the force itself. Sever Force - Master - Long ago, few Jedi were taught in the ability to quite literally, remove the force potential from a person. Rarely performed, and even more so practiced, The act of removing the force from a person is a skill that Shaun can block, or even completely remove the force from an individual. "The Gift" - Master - A long forgotten ability for centuries. It is an ability for Shaun to gift or curse someone with the force itself. Empowering those he chooses, The Dark side of the force will flow through the recipient greatly. The physical appearance can easily change due to Dark side corruption of the receiver, including Yellow/orange/red eyes, Innate usage of Force Lightning, and a change in their speech patterns. Telekinesis - Master - The affecting of objects, people, beings, creatures, or otherwise through the use of the force. This term is used for the general use of affecting others through the force with direct action of Shaun's influence over this skill. Such skills as push, whirlwind, and the like are very possible. Precognition - Master - A skill gained by many of the Echani due to their military, and warrior like culture. This is primarily used as a form of "Battle Precognition" to allow Shaun to predict the actions that others take towards him, or others. While this can take some time to understand for different people, or those he has not met before, its very much possible, and a very useful tool for him. Technometry - Knightly - While it is an ability that he doesn't use as often, Shaun can interact as well as control electrical systems such as Datapads, Lightsabers, Batteries, ships, etc. Echani Martial Arts - Master - The only true martial art discipline taught to the young man, it is an artform that borders on dancing. Using unarmed combat with little to no armor, and no direct usage of the force, those to study and practice this discipline have been known to have rudimentary forms of Battle Precognition. It was also seen as a form of communication as no to styles of fighting were the same. This allowed all members to be able to tell the difference from one another due to their very close resemblance of one another's physical appearance. Vibroblade/Sword - Master - A practitioner of vibroblades and other sword like weaponry, Shaun is rather skilled in single sword, dual sword, and double bladed swords. As all three of those usage stems from his Echani Heritage, He is a capable combatant. Blasters/Slugthrowers - Knightly - While not an ace shot, nor is he the worst, Shawn was taught how to use such weaponry. Hand him one of these, and it would be very easy for him to figure out how to use it. Even more so with his technological usage of the force, he can improve upon them, and their usage. Bow/Crossbow - Master - Having lived with a father that hunted for a food source, Shaun can hunt rather well with this form of weaponry. While considered primitive in every sense, hand it to him, and he would likely out shoot himself with a bow, than a blaster. Edited by Shaun Castanic, 29 September 2018 - 07:30 AM. AA-TKB - Compound bow used for ranged engagements. While not the best sort of weapon for full fledged combat, it is useful for silent operations, or simply hunting. Bluebolt Blaster - A blaster pistol aptly named for its blued metal surfaces and the blue blaster bolt that is fired from the weapon. Slightly longer than your average blaster, but light enough to afford such length. Perfect for longer ranges with a pistol, but not heavy as a rifle. The Pale Rider - As a payment for an auction set up for the company Yusanic Ironworks, Shaun received a special pistol that will allow him to use any time he so chooses. This weapon is his go to sidearm. Aurora Lance - A short barreled rifle with a blade attached to the entirety of the weapon. The Gardener's Sheers - An executioners sword uses for the specific purpose of removing limbs. An added feature is that this weapon can capture the souls of all those it kills. Arael - A lightsaber that once belonged to Anora Shaw, the lightsaber is now in the hands of Shaun due to unforeseen circumstances. Echani Vibroblades - A set of vibroblades created by himself with Cortosis-weave. Used for a few years as a fighter with the Echani and their various culture standards, and uses, but also a set of weapons should he ever happen to come across Lightsabers. Energy Shield - Echani based in design, it was created and still used to provide protection against various energy weapons, as well as sonic weaponry. Dueling Shield - A bracer worn on the forearm that can be activated into a disc shield used to defend himself from many forms of weaponry. While it can only take a couple hits on its own, a larger energy source can prove fruitful. Gravitas Series Boots - A very nice set of boots that allow better mobility along walls, and ceilings. Second Sight Glasses - While looking like a simple pair of glasses, they allow the user to see the force much like Nightvision. Hidden Datapad - Rather useful for his hands, Shaun can be seen carrying this fairly often when he is in need of it. Duelist Brand Belt and Sheaths - A belt and sheathes created to hold various melee weaponry in particular. Resists force sense and direct force actions for the weapons upon the belt. Mother's Kiss - Worn nearly all the time, this necklace was a gift given to him by his mother. While his mother is unknown, he knows it came from her as his father actually found it in his possession when first dropped off at his door. Moonlight's Vision - Vision is an important thing. Created by a sacrifice of one man's vision, this mask can bestow the wielder enhanced vision through the force. Auberon - A set of highly kinetic resistant armor that allows Shaun to fight hand to hand, melee and even lightsaber combat fairly easily. However, it is fairly weak for just about anything else that comes his way. Echani Fiber Armor - A light set of fiber armor custom made for Shaun's use. Dyed black with a set of red robes worn over the top, this armor is light to allow superior movement, but enough protection from general small arms fire. Vondiranach Brand Fiber Armor - A special set of Fiber armor that has been updated for the current time. Shaun owns both types of these fiber armor and chooses to wear them whenever he feels he may need one over the other. Yusanic Ironworks and Forge - Company - A company that aids in the construction of weapons, armaments, armor, and armored clothing. Edited by Shaun Castanic, 06 November 2018 - 07:18 AM. Edited by Shaun Irons, 29 June 2018 - 04:06 AM.